I was up early with both kids. Christy was still sleeping. I was holding Harrison and all of a sudden I hear Hadley from downstairs say she needed help in the bathroom. 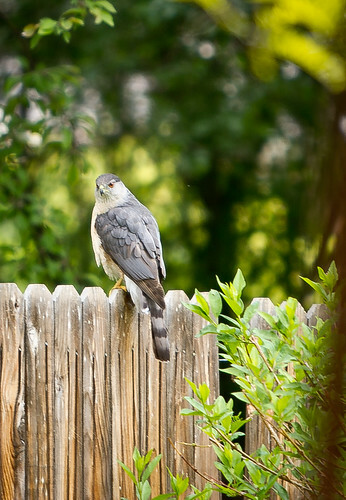 So I was walking down the stairs with Harrison in my arms, a milk bottle and that is when I saw this gorgeous hawk fly into the yard and land right by the bird feeder and bath on the fence. I look over and my camera just happens to be sitting on the bench in the entry way. So, i yell to Hadley - "HOLD ON FOR ONE SEC" and put the boy on the dog bed, bottle on the floor, grab the camera and start shooting. The bird even jumped around to stare directly at me, but my camera just couldn't get focused. Not sure what I was doing wrong.